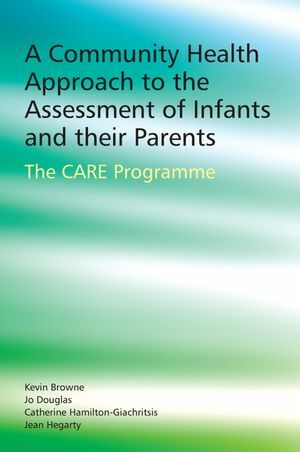 This book is a practical guide to the CARE programme, a home visiting programme that aims to assess infants? growth, development and psycho-social transitions in their first year of life and that together with the Index of Need checklist aims to engage parents in risk assessment. It provides evidence-based research for the programme, and gives clinical examples of how to use the assessment tools (including the Index of Need) and how to work with parents. The authors take a ?partnership with parents? approach throughout, while bearing in mind the practical workload issues that practitioners face. Jo Douglas is a child clinical psychologist and was Head of Psychology at Great Ormond Street Hospital, London. She is the author of seven books, including Toddler Troubles published by Wiley in 2002. Kevin Browne is Professor of Forensic and Family Psychology at Birmingham University. He has edited two Wiley books, and was one of Child Abuse Review's founding editors. Catherine Hamilton is a lecturer in Applied Psychology at the University of Birmingham. She is co-editor of Early Prediction and Prevention of Child Abuse, which was published by Wiley.